When I was a child in the ’70s, a new type of story was filling the market. It was a story book where you got to choose what happened. You’d be introduced to the characters and a situation but then you’d reach the end of the first chapter where you were told to choose which action then would happen. If you chose one, you’d be sent to a certain page. If you chose the other, you’d turn to another page. When you had finished whichever chapter you chose, you were given another set of choices, and this continued until you reached the end of the book. For a young reader it was a fun way to extend the adventures in the book because you could keep reading the same book over and over, making different choices each time for a completely new story. As an adult, I love the complexities of life which are subtly shown by this “pick the next action” type of storytelling. Our lives are made up of little daily decisions which lead to other little decisions, to regrets, to rewards, to joys, to sorrows, to bigger choices, to serious consequences, to surprises… and there are times when we wish we could go back and make another choice, and other times when we are grateful we made the choices we did. New Year’s is usually a time when we find ourselves thinking back upon the choices of the year which just passed and thinking about the decisions we’ll need to make for the new year to come. For most, our years are a mixture of both good and bad, and New Year’s is when we think about how to make more good in the year to come. The truth, though, is that every minute of every day, all year long, is an opportunity because we continually are writing our life stories with every decision, every thought, every word, every action we pursue. So, as we begin 2017, I invite and encourage you to consider the choices you’ll make for a healthier, happier you. Whatever the choices you make in 2017, my hope and prayer for you is that the new year will be filled with much light, much love, and much laughter. 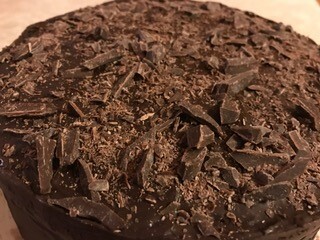 And in the spirit of choices, I give you a recipe for a chocolate torte which allows you to choose how you want to make it to fit your particular dietary needs and preferences. You can make the cake layers plain chocolate, minty chocolate, almond chocolate or fruity chocolate. You can make the filling any of the same flavors and in a variety of ways. You can top it any way that you want. You can make it gluten, dairy, nut, soy, egg or all of the above free. It’s your choice! Preheat oven to 350 degrees and prepare four 9 inch cake pans by either lining them with parchment paper or greasing and flouring them or spraying them with Pam spray. Move the racks in your oven so they are evening spaced for putting two cake pans on each rack. Mix together the flour, cocoa powder, sweetener (if using sugar or coconut sugar), baking soda, baking powder and salt. Set aside. Mix together the binder, “milk”, oil, extract and sweetener (if using agave). Add the wet ingredients to the dry with the boiling water and the vinegar or lemon juice. Blend just until dry ingredients are moistened. Divide the batter evening among the four prepared pans. Bake in the oven for 15 minutes, switching the cake pans between the two racks halfway through. Cakes will be slightly puffed, pulling away from the edges, and a toothpick inserted in the center will come out clean. Leave the cake layers in the their pans and allow them to cool on a wire cooling rack. Add the cream of tartar and begin mixing the liquid on low speed, slowly increasing to the highest. As the liquid begins to become frothy and foamy, add the powdered sugar, one tablespoon at a time. Mix until the liquid becomes thick white peaks like an egg meringue. Put the chocolate pieces into a microwave safe dish for a minute and stir until the pieces are all melted or put the chocolate pieces in a pan over another pan filled with boiling water and heat and stir until the chocolate is all melted. Add the extract of choice to the chocolate and mix well. Add a little bit of the chickpea meringue to the chocolate mixture and gently fold it into the chocolate. Then add the chocolate mixture to the bowl of meringue, folding in just a little at a time until all the chocolate has been added and folded into the meringue. Transfer to the fridge to thicken until needed to fill the torte cake layers. Mix the cream with the extract and beat at a high speed until soft peaks begin to form. Add the sweetener of choice, a little at a time, and continue beating until stiff peaks form. Put the whipped filling in the fridge until needed to assemble the torte cake layers. In a mixer, whisk the cream cheese until smooth. Add the chocolate mixture and beat well. Add the remaining whipped topping and blend well. Put into the fridge until needed to assemble the torte cake layers. Make your favorite mousse recipe as a filling or simply your favorite frosting recipe as the filling. On a cake platter lay the first cake layer. Spread one third of the filling you chose to make. Top the filling with the second cake layer and spread the second third of the filling. Top the filling with the third cake layer and spread the last of the filling. Place the last cake layer on top. Choose a topping option to cover the sides and top of the torte. Melt dark chocolate or semisweet chocolate chips (regular or Enjoy Life variety) in your microwave and stir until smooth. using a frosting spreader, coat the sides and top of the cake with the melted chocolate in a very think layer. Before the chocolate solidifies, sprinkle the top with chopped chocolate pieces. Make your favorite frosting recipe and frost the sides and top of the torte. Make a ganache: Warm 1 cup heavy cream or coconut cream in a microwave just until hot to the touch. Pour over 8 ounces of dark chocolate or semisweet or bittersweet chocolate pieces (regular or Enjoy Life variety) and stir until completely smooth and silky. Allow ganache to cool to a spreadable consistency.